Mr. Cohen graduated from DePaul University with a Bachelor of Science and Commerce degree, awarded with honor, in 1978. Mr. Cohen has been a member of the National Honors Accounting fraternity, Beta Alpha Psi, since 1977. Mr. Cohen became a Certified Public Accountant in 1980. Mr. Cohen worked as an auditor for the public accounting firm of Altschuler, Melvoin, and Glasser from 1977 until about June of 1980. 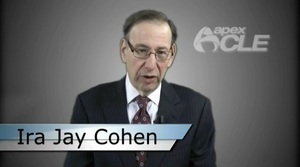 Mr. Cohen has been a licensed practicing attorney at law in Illinois since 1983. For over 29 years, Mr. Cohen has had his own law practice, and has concentrated his practice in all aspects of family law. Since about 1992, he has been on the approved list of Child’s Representatives in the Circuit Court of Cook County, Illinois. Mr. Cohen has acted as a Guardian ad Litem and as a Child’s Representative in numerous contested custody cases in Cook County, Illinois. Over the years, Mr. Cohen has represented many men and women in all types of family law cases.